Hat tip to Karen Meek of Euro Crime for introducing me to this series of audio books, I will definitely be looking for more of them. The story was a complicated one and I’ll admit to getting a bit lost with it a few times. It relied very heavily on an ability to visualise the setting (if it had been a print book I’d have been looking for a map) and also tended to wander down rabbit holes of varying depths and degrees of relevancy. Despite all that, or perhaps because of all that, I was engrossed. It ended up being an epic story which almost totally failed to go in a single direction that I predicted; a definite highlight for someone who has read more than her fair share of whodunnits. Along with the crime there is history, art, Egyptology and a half-dozen other subjects explored, several of which appeared to have nothing whatsoever to do with anything at all but which I found thoroughly entertaining. 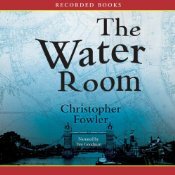 But the real highlights of The Water Room are Bryant and May, as brought to life by Tim Goodman (I suspect this will be another series like the Grabenstein/Woodman collaborations which I only ever read in audio format). The characters are deliciously full of quirks and might just be the prototype for what all crime fighting duos will turn into if they work together long enough: resigned to the annoyances caused by the other’s shortcomings but usually quick enough to circumvent the worst impacts of those quirks. Bryant is socially awkward, has an eclectic collection of friends and ‘experts’ to call on for crime solving and a pathological inability to use technology without it breaking. Or worse. May is multiply divorced, loves gadgets (before Bryant breaks them) and is a master at getting people to tell him things they’d rather not. Their relationship with each other makes great listening, as do their interactions with their team, especially their long-suffering sergeant who once daydreamed of being a screen goddess and still wears the clothes. This might not be the book for everyone, certainly not those who look for order and straightforward logic in their crime fiction. But if you don’t mind meandering your way to an entertaining denouement and you enjoy complex, well-drawn characters who demonstrate you can still be smart even after you have reached ‘a certain age’ then I would highly recommend this one. I have already got my eyes (ears) on the next in the series (and would love to listen to the first in the series but only books 2-6 of the 9 book series are available to me in Australia in audio format, the others are geo-restricted) (but I’ll save that rant for another day). This entry was posted in book review, Christopher Fowler, England. Bookmark the permalink. I have heard that this is a great series, and I have put the first book on reserve at the library. This review is making the wait harder. A peculiar crimes unit? We should all have one, I am sure. But a story where you easily get lost may not be my thing – I´d never get back out of it again.